This story is months old, but received some attention in the last week. In March, the Fed released the details of its lending during the financial crisis, under court order. Whether it took Bloomberg 9 months to process the information, or the timing just seemed right, Bloomberg had a story this week (I think; there is no date on the post) on the details. Further, Eliot Spitzer (how could we forget him?) and Jon Stewart picked up on it. It has of course been well-known for a long time that the Fed lent to financial institutions, particularly large ones, in a massive and unprecedented fashion during the financial crisis. This is the first instance I know of the release of information about the details of the Fed's lending operations - who received the loans, how much, and at what interest rates. Typically we know the total quantities of discount window lending through the Fed's primary and secondary facilities, which appears in the Fed's reported balance sheet numbers, but little else. It would be useful at this point to review the Fed's key lending programs to financial institutions that were active during the crisis. 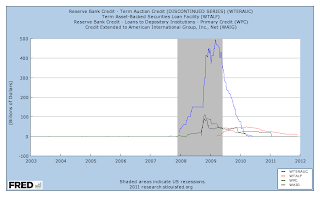 In the chart, I show the Fed's lending through the Term Auction Facility (TAF), the Term Asset-Backed Loans Facility (TALF), primary credit (regular discount window lending), and the specific AIG lending program (which gets its own line on the Fed's balance sheet). As you can see in the chart, total lending by the Fed gets up to at most $600 billion - nowhere close to the $7 trillion that got gasps from Jon Stewart's studio audience, but nevertheless some serious pocket change, considering that the size of the Fed's balance sheet pre-crisis was about $900 billion. The interesting thing here is that, early in the crisis, lending to AIG and through the primary credit facility totaled less than $200 billion at most, with the majority of the lending conducted through the TAF. Thus, most of the discount window lending during the crisis occurred by way of auctions rather than through conventional lending. Note that some of the media stories focused on the fact that some of the loans went out at 0.01%, when the discount rate (the rate on the primary facility) was 0.5% at its lowest. These 0.01% loans had to occur through TAF. The Bloomberg story makes a calculation that the Fed gave away $13 billion to various financial institutions, but if most of the funds were auctioned off, this can't be right. But how could a financial institution win an auction at 0.01% when the funds could be held as overnight reserves and earn 0.25%? The usual answer for this is "stigma," which actually seemed to be a concern of the Fed during the crisis. The Fed wanted to inject more liquidity into the financial system, and sometimes seemed to think that financial institutions were unwilling to take this as loans from the Fed. Why? There is empirical evidence and theory (in this paper by Huberto Ennis and John Weinberg) that banks are reluctant to borrow from the Fed because this might signal that they are in trouble. But why would banks face stigma if the Fed keeps the details of its lending programs secret? Apparently there are ways to figure these things out, at least for large institutions. For example, a large quantity of lending in the Richmond Fed district is likely going to Bank of America. So if financial market participants can figure these things out anyway, why should the Fed keep its lending a secret? Why indeed? Central bank lending is typically rationalized by appealing to the lender-of-last-resort role of a central bank. The conventional view is that there is some temporary market failure that makes the assets of some financial intermediaries temporarily illiquid, or there is an inherent vulnerability of illiquid banks to panics. Thus, it might seem useful for the central bank to lend to financial intermediaries during a crisis. The central bank takes the "illiquid" assets as collateral on its loans, potentially giving the collateral a haircut commensurate with its "true" market value. Central banks are supposedly wary of lending to banks which are actually insolvent rather than just illiquid. It is certainly not economically efficient to prolong the life of a bank that will fail anyway. But run your mouse over the chart in this Bloomberg post. The three largest borrowers from the Fed during the crisis were Citigroup, the Bank of America, and the Royal Bank of Scotland. It seems widely recognized that the first two were essentially insolvent during the financial crisis, if not now, and the last one essentially failed during the crisis. Lending to these banks certainly does not appear to have been simple liquidity-easing. I think one could make a case that the details of all of the Fed's activities, including its lending, should be made public, at the time these activities take place. 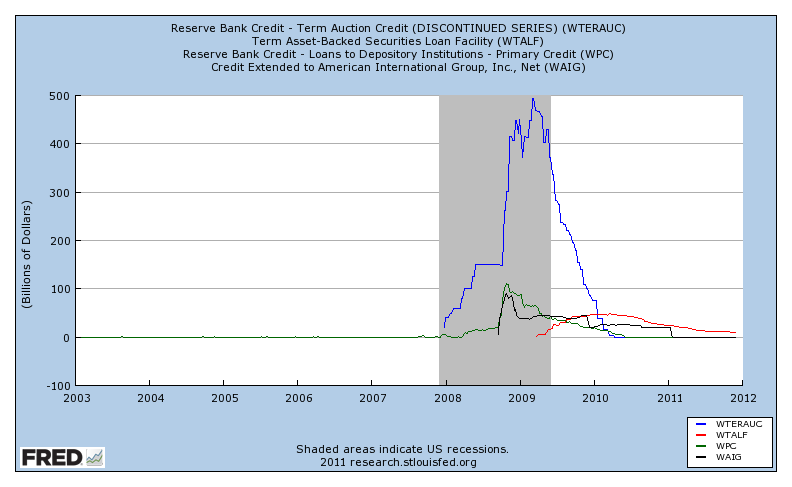 Surely, there is stigma in borrowing from the Fed only if the Fed lends to banks that are essentially insolvent. If the Fed sticks to its appropriate lender-of-last-resort role, then it is only correcting short-term liquidity problems. Indeed, if the Fed is doing its job, then a Fed loan should be a certificate of viability. In any case, we need more serious research on central bank lending, when it is appropriate and when it is not, what is appropriate collateral for a central bank loan, what are appropriate collateral haircuts, what is the role of central bank lending relative to conventional and unconventional open market operations, etc. Do you have any sense of how much of a time constraint these officials were under during the crisis? I mean, could one give away $13billz on accident when dealing with 7trillz over 3 weeks time? On the time constraint: During the crisis, clearly the Fed decided it wanted to become a lender of last resort, big time, and that most of the lending was to go out through the TAF program (auctions) rather than through the primary discount window facility. However, the idea is that, to borrow through TAF, a financial institution has to meet the requirements to use the primary facility. If you're short on time, maybe you're not checking carefully, but of course most of the lending was to large institutions, and the Fed knew who and what these institutions were up to. You might think of the intervention as being more about too-big-to-fail than anything else. The $13bln is a simple back-of-the-envelope calculation done by the Bloomberg writers based upon a given financial institution's average post-tax interest earned (the %) times how much money they received from the Fed minus the rate at which it was lent. Obviously, this figure is almost too simplistic to be useful. The 'gasp' figure comes from total loan limitations and debt guarrantees the Fed made. Thanks for settin' me straight. I thought some Rational Inattention might be going on, but I suppose the Fed has intimate knowledge about most of these institutions. Some people see as evidence of stigma at the DW the fact that sometimes the bidding of some banks at the TAF was at rates higher than the DW rate. The idea is that there was less stigma attached to the TAF than to the DW. Some of the TAF's organizational features could be the reason for this difference. In this narrative, banks were willing to pay higher rates at the TAF rather than going to the DW where the possibility of stigma was higher. Now, the 0.01% interest rate that you talk about, and the fact that this does not seem to make sense since banks could just get 0.25% IOR, I have not heard before as providing evidence of stigma. Do you mean stigma at the TAF? That's what I was thinking. Why would the TAF imply less stigma? You are borrowing from the same source, and the criteria for eligibility are the same. "To address this issue, in late 2007, the Federal Reserve established the Term Auction Facility (TAF), which, as the name implies, provides fixed quantities of term credit to depository institutions through an auction mechanism. The introduction of this facility seems largely to have solved the stigma problem, partly because the sizable number of borrowers provides anonymity, and possibly also because the three-day period between the auction and auction settlement suggests that the facility's users are not relying on it for acute funding needs on a particular day. As of April 1, 2009, we had roughly $525 billion of discount window credit outstanding, of which about $470 billion had been distributed through auctions and the remainder through conventional discount window loans." "...the sizable number of borrowers provides anonymity..."
Does this mean that, if the loan goes out through the primary facility, it shows up as a loan from an individual regional Fed, and it's easier to make inferences about which bank got it? I'm guessing the TAF was a facility run by the New York Fed, so particularly with $500 billion in TAF funds outstanding, you have no idea who is getting it. But are there other ways to find out where the loans go? And, as I mentioned above, if the Fed is doing this properly, why should there be any stigma anyway? Very useful resource for feasibility study on economic trends and stability. TY.